The LG V10 is a smartphone that runs on the Android operating system. This model has a 5.7-inch touch-screen display, a 15.9-megapixel camera, and a virtual QWERTY keyboard. 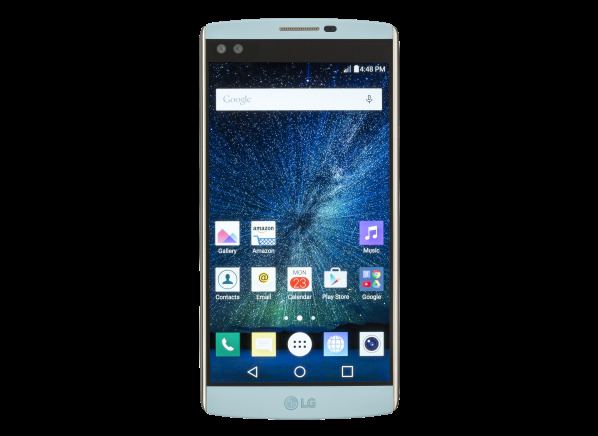 The LG V10 is a smartphone that runs on the Android operating system. It has a 5.7-inch touch-screen display, measures 6.3 by 3.1 by 0.4 inches and weighs 6.9 ounces. The V10 has a 15.9-megapixel camera that can record high-definition video, a front-facing camera, and a music player. It also features a virtual QWERTY keyboard that's useful for messaging and Web searches. This phone has WiFi, Bluetooth for wireless hands-free communication, DLNA, and GPS navigation capability. Web browsing, e-mail, and texting capabilities are also included. It can act as a mobile hotspot for WiFi-enabled devices. This LG phone has a standard 3.5mm jack. It has 64GB of built-in memory, and supports memory cards of more than 128GB.